I always make too many plans - but compared to my past output, what I've done this year is so outstanding that it makes me think I can decide which pieces I need to build a basic and versatile wardrobe, based on the events I've gone to this year (which is, again, an astounding amount compared to how many I attended in previous years, mainly thanks to Julie). - What surprises me when I think of it, for some reason, is that Victorian events have been the most frequent this year. And yet, my Victorian wardrobe is sorely lacking. Probably the best place to start would be with remaking my early Victorian bodice so that it is narrower and a little bit longer. I do have some extra fabric, and I'm pretty sure it's still being produced and sold, so that shouldn't be a problem. I'd also like to make sure I have a center front seam, and to pipe the seams, at least the main ones and the armscyes. Also from FIT; Clara and I dressed it! - In addition, I'd like to make a second, slightly later bodice with more fitted sleeves. Just because. It won't necessarily look like the above, but the sleeves will probably be similar. Why? Because I get more bodice practice without having to make, or, more importantly, buy the fabric for another skirt. - To round out my Victorianism, I'd like to also have an 1890s outfit, but I'm not really sure what it should be. My fitting skills are still quite low, which is unfortunate as the 1890s are a very fussy decade, so perhaps it will be a shirtwaist and skirt, or a lingerie dress. Yes, that sounds about my speed. - And, last but not least, a decent Regency gown. I have the one I made for my qualifying paper (technically pre-Regency) and the one I made for Tulipfest (too big, too nightgowny), and I'd like to just start over and make something decent. However, this will probably wait until I've taken some Regency patterns for After the Fashion II: 1800-1849, as I find it easier to sew once I've really thoroughly investigated extant pieces. And that will be sooner than you may have expected! In 2014, I'm going to start patterning for the next book. 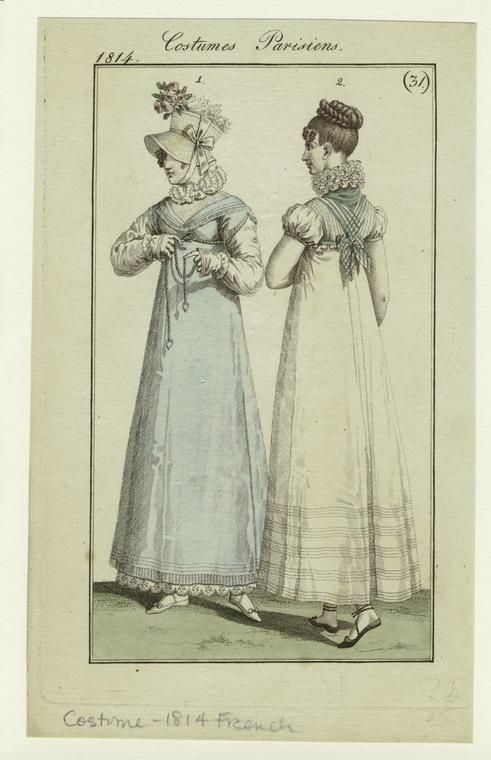 I'm probably going to be doing just about everything I can get my hands on, but I was wondering - is there anything in particular that any dear readers have seen in paintings, fashion plates, museums, etc. and wished they had a pattern for? Would you like to see variations on early 1840s evening dress sleeves? Different types of late Regency hem treatments? Wool vs. silk spencers? Please let me know! And don't forget about the Creating Historical Clothes giveaway, open until midnight (EST) on Friday, December 20! Hi there! I'm so glad you included the dress from the FIT collection--I have been "fan"tasizing about making a fan front bodice for awhile now, as I think it's one of those universally flattering choices for almost every wearer! Don't know if there are any others out there who feel the same, but if there are, maybe you'll show us how to pattern that? Thanks for all the creative posts! If it's possible, I'd love to go back and pattern this one - but I will keep an eye out for others. Thank you for your many comments! The fan-front dress is great. The self-decoration gives it such elegance. Hope that you make it!